Bruce Champagne has had an independant classification for sea-serpent types that has been circulating around the internet for some years. The article is at StrangeArk: Bruce Champagne. A Preliminary Evaluation of a Study of the Morphology, Behavior, Autoecology, and Habitat of Large, Unidentified Marine Animals, Based on Recorded Field Observations. Available at strangeark. Pages 99-118 And I have never been able to get in contact with Bruce despite frequent trying (I tried just before submitting this blog entry, in fact). 1A Long-Necked: A 30-foot sea lion with a long neck and long tail. The neck is the same thickness or smaller than the head. Hair reported. It is capable of travel on land. Cosmopolitan. 1B Long-Necked: Similar to the above type but over 55 feet long and far more robust. The neck is of lesser thickness than the head. Only inhabits water near Great Britain and Denmark. 2A Eel-Like: A 20 to 30-foot-long heavily scaled or armoured reptile. 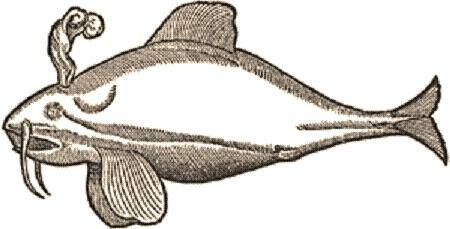 It is distinguished by a small square head with prominent tusks. 'Motorboating' behaviour on surface. Inhabits only the North Atlantic. 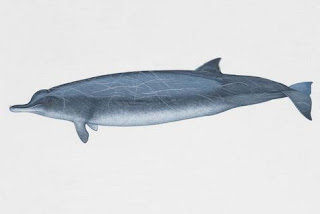 2B Eel-Like: A 25 to 30-foot beaked whale. It is distinguished by a tapering head and a dorsal crest. 'Motorboating' behaviour engaged in. Inhabits the Atlantic and Pacific. Possibly extinct. 2C Eel-Like: A 60-70 foot, elongated reptile with no appendages. The head is very large and cow-like or reptilian with teeth similar to a crab-eater seal's. Also shares the 'motorboating' behaviour. Inhabits the Atlantic, Pacific, and South China Sea. Possibly extinct. 3 Multi-Humped: 30-60 feet long. A possible reptile with a dorsal crest and the ability to move in several undulations. The head has a distinctive 'cameloid' appearance. 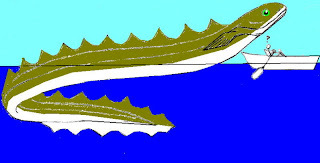 Identical with Cadborosaurus willsi and is behind the Naden Harbor carcass. 4A Sailfin: A 30 to 70-foot beaked whale. It is distinguished by a very small head and a very large dorsal fin. Only found in the North West Atlantic. Possibly extinct. 4B Sailfin: An elongated animal of possible mammalian or reptilian identity reported from 12 to 85 feet long. It has a long neck with a turtle-like head and a long continuous dorsal fin. Cosmopolitan. 5 Carapaced: A large turtle or turtle-like creature (mammal?) reported from 10 to 45 feet long. Carapace is described as jointed, segmented, and plated. May exhibit a dorsal crest of "quills" and a type of oily hair. Cosmopolitan. 6 Saurian: A large and occasionally spotted crocodile or crocodile-like creature up to 65 feet long. Found in the Northern Atlantic and Mediterranean. 7 Segmented/Multi-limbed: An elongated mammalian creature up to 65 feet long with the appearance of segmentation and many fins. Found in the Western Atlantic, Indian, and Pacific. 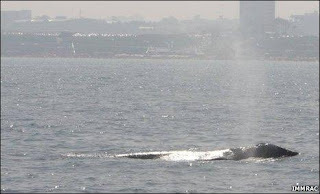 This matter came up again because of the recent reports of a grey whale seen in the Mediterranean. I had previously identified one of Bruce's categories as the same as the 'Scrag Whale' and hence a grey whale, and I mentioned that was my opinion on Darren Naish's blog the first time the matter was posted. I had first posted about the matter at my group, Frontiers of Zoology, when the group was new, 2006-2007. Bruce's long-necked categories 1A and 1B are basically Heuvelmans's long-necked and merhorse categories. They are quite possibly female and male of the same species. The lengths he gives tally well with my average estimates (assuming female and male lengths) worldwide. Nowadays, I would say those estimates are probably on the high side for both series of reports, even though Heuvelmans's estimated lengths are much longer. The interesting part starts with 2A. 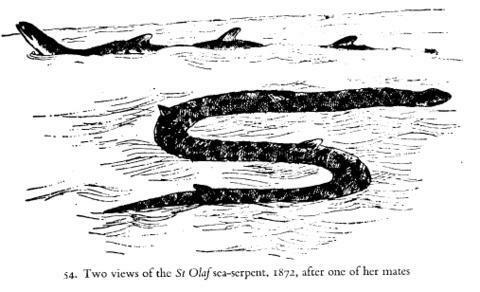 This is obviously the same as a 'Tusked Whale' reported in the South Pacific and Indian Oceans, and Gesner has a depiction of it. It is not a reptile at all, and I think some of Bruce's sightings are from the New England area. There is a fossil form that corresponds to the description, Odobenoketops, although the fossil form is much smaller. The fossil form is well known in Cryptozoological circles owing to another matter, which is possibly an overlapping category, Southern Narwhals as discussed by Karl Shuker. Category 2C is evidently a type of giant eel: I have no idea why BC thought it had the odd teeth he ascribes to it. Perhaps the teeth are due to confused reports of actual seals. The reconstruction is oddly short and stumpy. My reconstruction from Heuvelmans' Super-Eel reports made composites of two quite distinct creatures which I called a Megaconger and a Titanoconger. 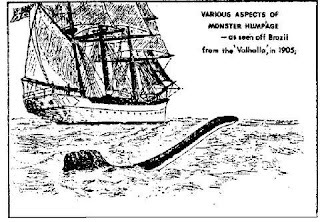 Heuvelmans was aware of the size difference (Megaconger 20-30 feet average, Titanoconger 50-100 feet long) but did not further subdivide the category. The two are also distinct in colouration and habitat.The freshwater Giant Eel reports generally correspond to the Megaconger and not to the Titanoconger type. 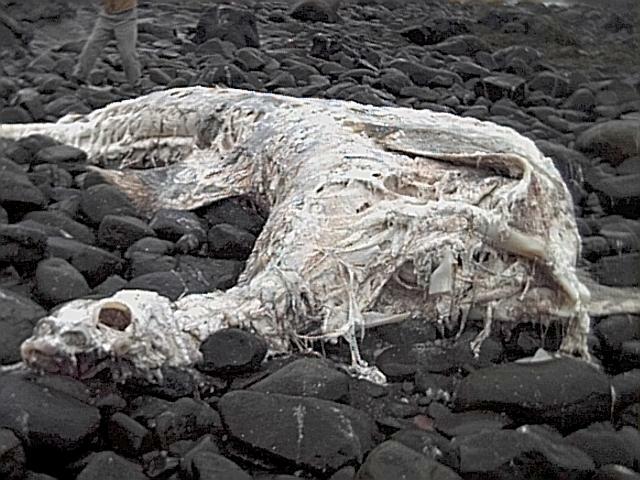 Category 3 is the same as the "Caddycarcass" creature, which I would say was a decayed shark (Pseudoplesiosaur). 4A is interesting because it corresponds to other reports of a type of beaked whale with a large backfin far back, also reported in the Pacific. And 4B is obviously the same as the Valhalla Sea-Serpent. I do not know why BC gives it such a wide size range nor Geographic range, although I was aware of other reports of the type (Heuvelmans calls one a "Marine Dimetrodon"). I actually do not know what it is, but with that head and neck it is presumably related to the Plesiosaurs. Category 5 is the Rhapsody-type giant turtle, obviously based on reports of a humpback whale turned turtle. Reports specify that the foreflippers are 15 feet long. Humpbacks are the only known animals that have 15-foot-long flippers. 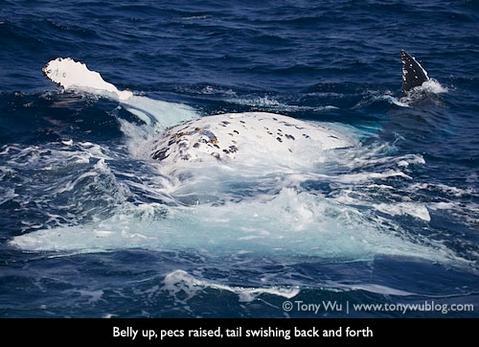 The "White Carapace" is the whale's lighter belly. Category 6 is an interesting subsection of the Marine Saurian reports and what BC has illustrated is a large seagoing crocodile, probavbly what was described as the Tarasque in the Mediterranean, the MedCroc. I append an illustration of a "Great Horned Alligator" made in review of Mark A Hall's article "'Horrors' From the Mesozoic, in PURSUIT. (Artist unknown). The same "60-foot horned Alligator (Crocodile) is spoken of in folklore and illustrated in Thailand, and other possible representations of it are from Indus Valley seals. It is worldwide in the warmer regions and better at swimming at sea than the much smaller C. porosis, which it otherwise resembles. This is NOT the only kind of "Marine Saurian": there is a type that is like an "Alligator" (including the C. porosis references) and then one or more other types which appear to be Mosasaurs. Category 7 is obviously the same as Heuvelmans' Many-Finned. It is much thinner than Heuvelmans' version and for comparison I include a reconstruction I once did of the Many-finned as an eel (to go with the St. Olaf sighting and several others). The "Manyfinned" is the most dubious of all of Heuvelmans' categories and all the reports could admittedly be mistaken views of small pods of sharks or toothed whales. The "Pluripinniate Eel" version does however preserve the blunt, turtle-shaped head mentioned in several reports. I do not attach much significance to the report of the Con Rit carcass, the description was most peculiar and at secondhand (or worse). So out of these additional categories I see some of the same familiar categories from Heuvelmans' In The Wake of The Sea-Serpents and some other things. The modifications on Heuvelmans' categories are interesting, although I have a different spin on them: and there are a few whales in there, one of a potentially new species but two known. One of the known species is probably the same as the Med Whale, and it has been seen rarely and irregularly for many years past the point when it was thought to be extinct. Just to point out, _Odobenocetops_ is the correct spelling for _Odobenoketops_. I guess I should have specified that the illustration for the reconstructed eel types (in color) are mine and are derived from my own research work, so that the buck stops here on those. Good analysis Dale.It has givem me food for thought.